Greetings All and best wishes for 2010, I hope you enjoyed your Christmas and New Year Celebrations and are rearing to get back into training. Training – For a while, it looked as if there would be NO training during Jan. However, when he heard of our problem, John Pickett, our Founding Chairman and very first Sweep generously offered to help on Saturdays. Then Susie decided she would sacrifice the flexibility she had so looked forward to enjoying during school holidays. This means you will have opportunity to train almost as per usual. (more information at end). I’m sure everyone joins me in thanking John and Susie for giving up their precious time. Don’t forget, commencing 7th Jan, Thursday training will consist of longer, harder drills. The goal being to develop endurance and speed – while maintaining technique. The Committee has always been aware of the need to cater for those who like to train for fun and fitness and those who want to do serious competitive paddling. By setting aside one session a week for the competitive paddlers and two sessions for the not so competitive we may go some way to solving the dilemma. This is really an indication of the growth of the Club (and I don’t mean numerical) so a very positive move. Almost all of you are ready and capable of tougher training – only you know whether its what you want. Come to whatever session you want – but know on Thursday’s you’ll be working up a sweat. Chinese New Year Regatta – 27th/28th Feb – that is less than 8 weeks to improve fitness and strengthen team spirit. The ideal would be ‘on water’ training as a team at least twice a week, Realistically that’s not likely to happen but it is important you try to fit in extra ½ hour a day, walking, swimming or some other exercise – for your own well being and minimising risk of injury. and off the trailer. Thanks to the Phil Beeby, Phil Lambert, Ian, George and Craig who have modified the boat trailer. Fellas, we bless you every time we put the boat out. 15 or more people to get the boat out it can be done easily with just 4 or 5 members. Christmas Breakfast – Thanks to our Juniors who cooked breakfast while the rest of us were able to enjoy a little time relaxing – well, the blokes didn’t, they were too busy working on the trailer. Terry Kastrounis isn’t saying much but word is he and his parents were happy with his HSC results, good work Terry and good luck in your career path. Gareth Petersen – also ended 2009 with some very successful scores (and prizes) on the golf course. Penrith Regatta – just as we were about to cancel plans to participate in this due to lack of paddlers, the Beeby/Micallef family and Megan, decided they could just fit in a regatta before heading off to do Christmas shopping and see the show ‘Wicked’. So with just 16 paddlers, including 5 members at their first regatta, a drummer and a fantastic ‘borrowed’ sweep from Central Coast Club, the CC Dragons, put up a very good show, no prizes but we weren’t far behind those boats with full crews and we had a lot of fun. Ryan, an old hand at drumming worked hard encouraging paddlers to give their all and Megan drumming at a regatta for first time shows lots of potential, look forward to seeing you up front again Megan. Oh, and Jo Beeby found time to buy 5 dresses between the regatta and seeing ‘Wicked’!! 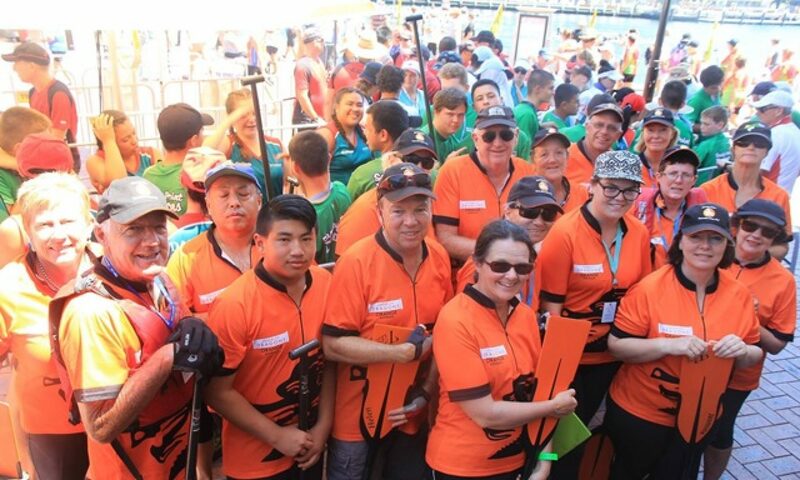 January 21st – Merge – a holiday activity program for young people run by combined community agencies has asked if dragon boating could be included on the programme this year. Your Committee have agreed subject to availability of Coaches, Sweep and few members to help out. Susie will be sweeping, Erin or Pearl will be there as coach. If 6 to 8 members could make themselves available for couple of hours on that day it would be very much appreciated. Last year when Nippers Surf Life Saving clubs came out it worked really well having our Junior Dragons in the boat so if any of them would like to help this time I’m sure we can organise ride out to the Lake and return. Merge will be paying for our services so more funds for the Club. Contact Pearl or Judy if you can help. Volunteers Needed – for Australian Championships at West Lakes, SA, April 22nd to 25th. If you’d like to help, can spare few days and would like to see dragon boating at its best as the top clubs vie for championship status let Melanie now ASAP, not sure on this level but on DBNSW level, accommodation is paid for volunteers and your Club receives a small contribution – could be a win win situation. DA Orange – Gail and Bev continued selling meat raffle tickets up until 19th Dec. A side effect of their fundraising seems to be an informal get together of CC Dragons at the Ophir Tavern on a Sat PM to enjoy couple of hours relaxing with friends. On the 19th when Christmas hams substituted the meat trays, Brenda Jones went home very happy – because she won a ham of course, no other reason. Overall winners will be announced on 18th Feb.
Stay turned – the above could change due to unforeseen circumstances.